Welcome at the Austrian Physical Society! In a study published in the special journal "Science", Kristina Kislyakova from the Space Research Institute of the Austrian Academy of Sciences in Graz as its first author explains how one can conclude from a distance of more than 150 light-years that magnetic fields of planets can protect their atmospheres from stellar wind. 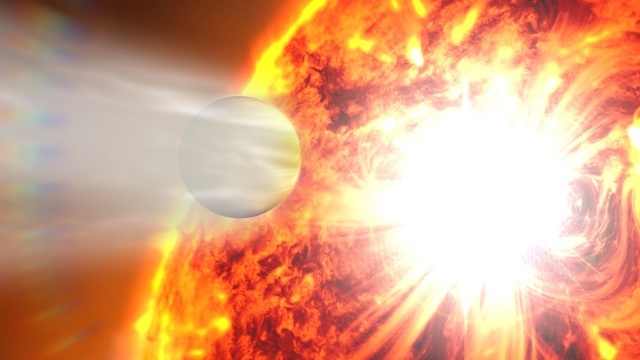 Symbolic image: The atmosphere of the planet HD 189733b is blown away by an eruption of its sun.